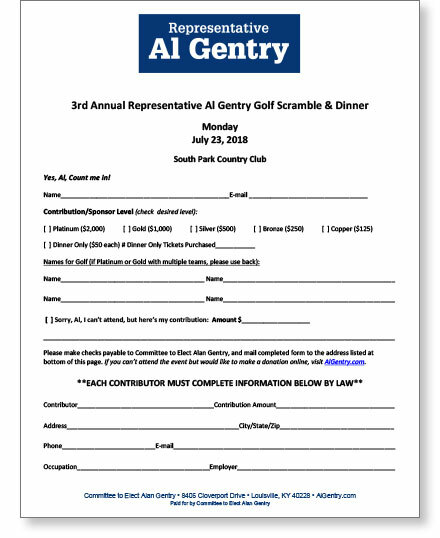 Please join us at the 3rd Annual Representative Al Gentry Golf Scramble & Dinner to be held Monday, July 23, 2018 at South Park Country Club, located at 915 South Park Road in Fairdale. Have a fun-filled day on the course, and enjoy some surprises that will make it both special and memorable. Free refreshments will be available during play on course. If you can’t join us for golf, please consider being a sponsor, and/or attending the dinner for $50. 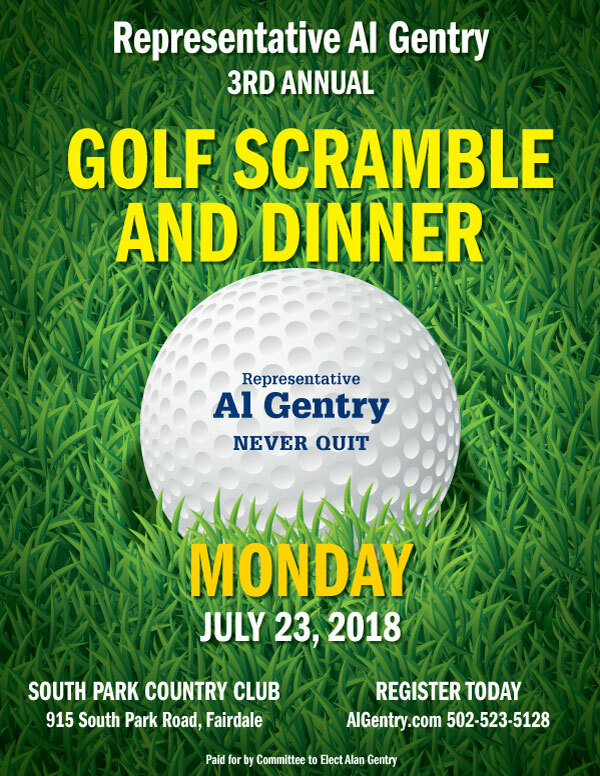 Net proceeds will be used for Al’s 2018 re-election campaign, as this tournament is a political fund-raising event. Contributions from corporations CANNOT be accepted. Checks from individuals and PACs are allowable. Also, we can’t accept cash or contributions from individuals under 18. Campaign laws limit the total contribution to $2,000. Entries are by invitation only and limited, so please download the Registration Form below and return it, with contribution, immediately, or no later than Friday, July 13, 2018. Prepayment is required for planning purposes and will ensure a timely start & finish to the day. See you at South Park!